The beauty ideal: The Slap-Dash Makeup Routine. I know I can't be the only one who has days where they know they need to make themselves look presentable but totally CBA at the same time. Firstly, I prep my skin with the Rimmel Stay Matte Primer and let that sink in a little before applying a thin layer of the Rimmel Match Perfection foundation. This primer and foundation isn't for everyone, but it's the pair that work best for me when a) I'm in a hurry and b) I need my base to not require touch ups. I quickly go in with Maybelline Better Skin concealer under my eyes and on any redness or blemishes I may have - this one works great for both. Letting that settle into the skin for a spell I'll move onto eyes. Again, keeping it really simple with just a little of MAC's Soba blended into the crease for slight definition and lashings and lashings of Maybelline's Lash Sensational mascara to finish. Brows I barely concentrate on - I just brush them through with Rimmel's Brow This Way and I'm good to go on that front. I set my base with the Rimmel Stay Matte powder before dusting Natural Collection's Suntint bronzing powder in a 3 motion on either side of my face to add some definition and colour back into my complexion. Because my makeup doesn't feel complete without blush, of course a little of NYX's Angel is needed on each cheek. I'll usually add a little lip balm to my lips rather than a lipstick just because it's easier to apply throughout the day and doesn't require any effort. Winner. 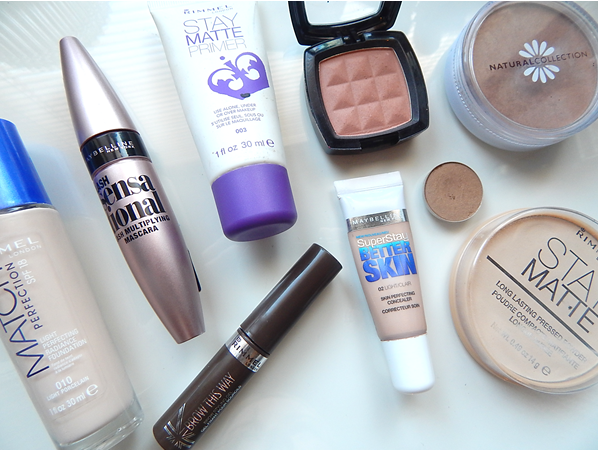 i really like the rimmel match perfection foundation, and i really want to try the stay matte primer and powder - great post!